This week we’re focused on the Good Book Club. The readings start this Sunday, February 11th. 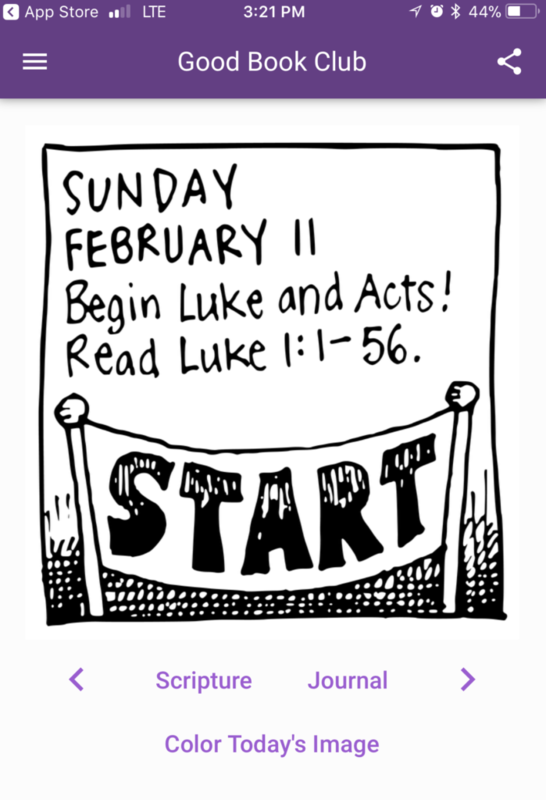 The Episcopal Church is reading Luke and Acts in Lent and Easter with multiple resources from around the church. So far in our series, Rachel Jones introduced the program. 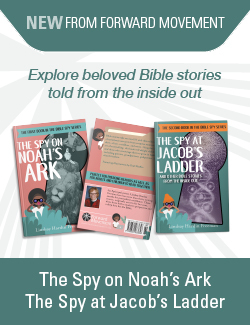 Melody Wilson Shobe shared how she’s preparing to read Scripture with her 4 and 8 year olds. Today I’m winding up our series with a reflection on how I’m preparing with teenagers. – Ed. This year, I feel like I am careening into Lent at a “mad dash” speed. That has definitely influenced my approach to getting ready for The Good Book Club. I have a thirteen year old, a sixteen year old, and a husband who works rotating 24 hour shifts as a firefighter. I serve a congregation, shepherd a new ministry, edit this blog, and volunteer for the Episcopal Church’s Advisory Council for the Stewardship of Creation. Just writing that makes me want to say a combination of “whew!” and “I need Lent.” I need a time to slow down and reflect. I need to refocus on the why of my life and not the what of my life. And my kids need that too. So far things are going great! Because nothing has really happened. My kids are blasé because they’ve seen this before. Last Lent I said “We’re doing Lent Madness.” And we did! For about two weeks. Every year in Lent our family gives something up. But as a family we have not yet done well taking something on. I don’t know if this year will be different, but I hope it will. No offense to Tim Schenck and Scott Gunn, but I’m more motivated for my kids to read Holy Scripture together than I am to have them compete with each other, even in a game about saints. I do know it won’t be easy. Two teenagers leave our home at 7:12am, 5 days a week. Together, they are in 3 extracurricular activities. Both have friends more interesting than mom and dad. It’s rare that both my husband and I are home at the same time with both kids home too. But I’m committed to trying to raise them not just to go to church, but to understand they ARE the church. There’s no better way than walking them through the story of why and how the church began. February 11th is coming. Here’s my plan. Step One: Download the iOs app from Forward Movement. (There’s an Android version too.) For the cost of a cup of coffee, It significantly increases the odds that I’ll keep this discipline. The same is true for my children. And family sharing means we all get the same download – at less than a buck per soul. The app has all the Scripture readings, squares to color as you complete each day, and a space to journal. There are social media sharing options. It’s pretty cool. Step Two: Set a reminder alarm. I need to start slowing down more, earlier in the evening. And so do my kids. In a perfect world, at 9pm we gather for a Lenten practice of family evening devotions. It’s not a perfect world, so this alarm might just serve to remind me that I better do my own reading and start getting ready for bed. My phone alarm will be set for 9pm (or maybe 8:50 to give myself a snooze option). Every day I’ll see what’s possible at that time. That’s when we’re all most likely to be home and able to pay attention. Step Three: Accept that we might not keep up. That’s okay, because we can catch up. Good Book Club readings might not happen for us once a day every single day. I’m okay with that. Once a week, if we haven’t read aloud regularly as a family, we can catch up, discuss the week’s readings, and start again. Sunday night – when I usually regroup and plan for the week ahead – will be the time to make that happen. In God’s economy, it’s always time to begin again. That’s what this Lent is for me: a time to begin again. January was very full. The beginning of February was too. I need Lent to remember who I am and whose I am. Thanks be to God, my church has a practice designed to do exactly that. I am ready to hear and offer the call to a holy Lent. Are you joining the Good Book Club with teens? What are your plans? Thank you for being so open. I thought it was just me who gets behind on the daily readings. Every Lent I start out saying I am going to do this at a specific time every day and before I know it I am behind. This year I am going to make a special attempt to read it every day no matter what time it is. Thank you for offering understanding instead of judgement! It is definitely not just you who gets behind on daily readings.